The treasury stock method is a way for companies to compute the number of additional shares that can possibly be created by un-exercised, in-the-money warrants and stock options. 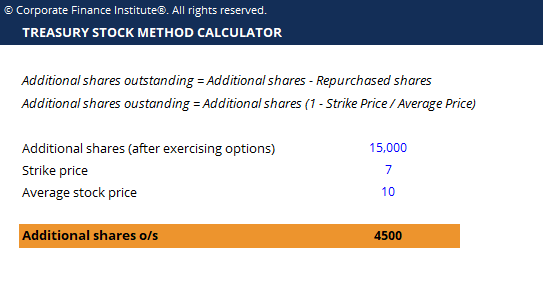 These new additional shares can then be used in calculating the company’s diluted earnings per shareEarnings Per Share Formula (EPS)The Earnings Per Share formula is a financial ratio, which counts net earnings against the total outstanding shares over a fixed period of time. A higher EPS ratio indicates a company’s ability to generate profits for common shareholders. (EPS). The treasury stock method implicitly assumes that the proceeds the company receives from in-the-money option exercises are then used to repurchase common shares in the market. Repurchasing those shares turns them into treasury stock, hence the name. The treasury stock method implicitly assumes that the proceeds the company receives from in-the-money option exercises are then used to repurchase common shares in the market. Repurchasing those shares turns them into treasury stock, hence the name.